While food may be the main attraction around the holidays, entertaining isn’t complete without a beautiful setting for dining. 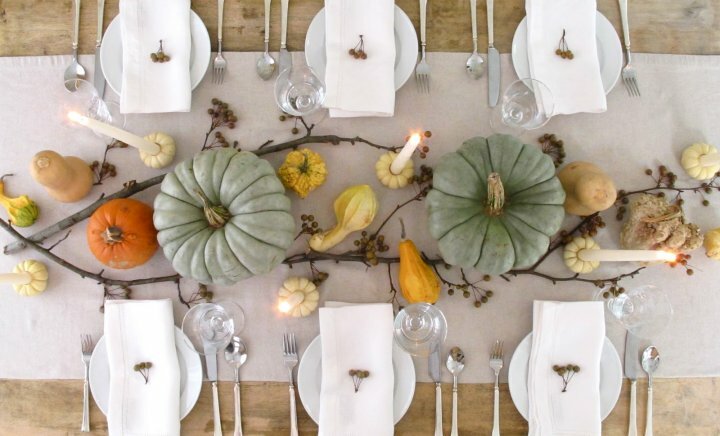 Wow your guests this season with these beautiful fall table-toppers. BRING THE OUTSIDE IN. Wrap votive candleholders or vases in unexpected materials, like twine or cornhusks, for an autumn feel. Use other natural, backyard elements — acorns, moss, fern, even cattails — and finish the table with white, classic tableware. The contrast is not only striking; it’s easy to achieve. RAKE UP SOME DÉCOR. Pair brightly hued clusters of leaves under clear plates for a simple alternative to placemats, or place a sprig in the tie around a rolled napkin. Give an old standby new life by creating a leaf collage under a sheer tablecloth. CREATE CENTERPIECES. Experiment with the staples of the season to get guests talking. Clean out a pumpkin and place a shallow vase of flowers within for an unexpected finish. Guests will remember your originality. PLAY WITH YOUR FOOD. Bright red peppers, deep purple beets, buttery yellow squash, and rich, soil-brown potatoes create a natural and homey feel. The vivid autumn colors of oranges or bosc pears, along with seasonal Indian corn and walnuts, make beautiful fall decorations. Arrange them into a simple centerpiece or use as the anchor for place cards. WORK WITH WHAT YOU HAVE. 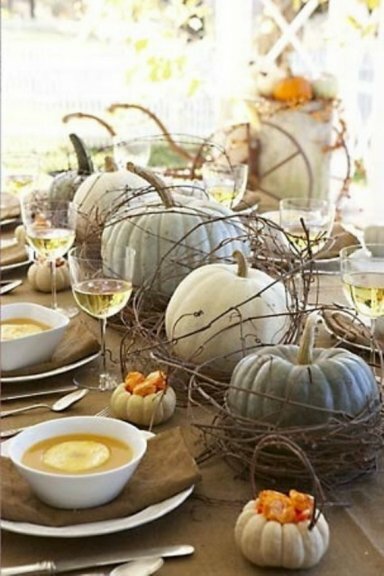 Fall entertaining is about gathering with loved ones, and decorations can be easy. If your tableware is understated, for example, use brightly colored napkins or use clear glassware and let the color of your drinks bring a pop of color. Or, use your favorite plates and incorporate subtle seasonal accents, like a smattering of pinecones or miniature pumpkins spray-painted to your liking.